This annual event celebrates the Lunar New Year with firecrackers, lion dances, and more. The Firecracker Ceremony and Cultural Festival takes place at Sara D. Roosevelt Park, where hundreds of thousands of firecrackers are lit to welcome the new year. 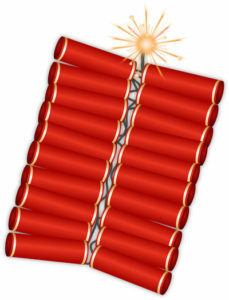 These aren’t aerial fireworks, but firecrackers, longs strands of them, and they make a lot of noise (see the video below). Earplugs might be a good idea. The festival also includes music dance, cultural booths, food vendors, and more. The 2017 event takes place Saturday, January 28th from 11:00 a.m. to 3:30 p.m., with the firecrackers starting at noon. Visit the Better Chinatown USA website for details. Sara D. Roosevelt Park is located on the Lower East Side of Manhattan, south of E. Houston Street and bordered to the east and west by Chrystie Street and Forsyth Street.